If you haven't heard.. Fuller House is on Netflix as of last weekend!! Me & Ty started it over the weekend and we just finished Episode 7 last night! In the 1st episode they had all of the cast members back together minus the Olsen twins. I wasn't quite sure how the season was suppose to go but.. that so far has been the only episode where they were all together. The main portion of the show has Stephanie, DJ, & Kimmy as the main characters along with their kids. Bob Saget.. first of all he just grosses me out in general.. BUT the first episode he was soooo so awkward to watch!! It's like he doesn't know how to act or he was trying to channel his inner Danny Tanner and it just wasn't quite working!! THANKFULLY he is not in the other episodes so I've been able to keep watching! Full House not every single episode was Lexi age appropriate.. but for the most part I have never felt too weird with her watching it. But, I won't be letting Lexi watch Fuller House.. I feel like it has some stuff I would still like to refrain. (my personal preference) It's honestly not bad and it's probably on the same level of the older kid stuff that's on the Disney Channel right now.. but they are still pushing boundaries on their family friendly rating trying to keep up with the new age of television. They have kept the show pretty funny! Last night Kimmy Gibbler had me laughing so hard at one of the scenes and the little boy in the show made me love him in the first episode! They have tied back Full House references pretty good. There is a lot of symbolic references they kept tying in. They have called out the Olsen Twins for not being in the show twice so far, in two different episodes. I can't tell if they have hard feelings for them not taking part or if they are playfully giving them a hard time?! The new rendition to their theme song.. love the new take on the same song! 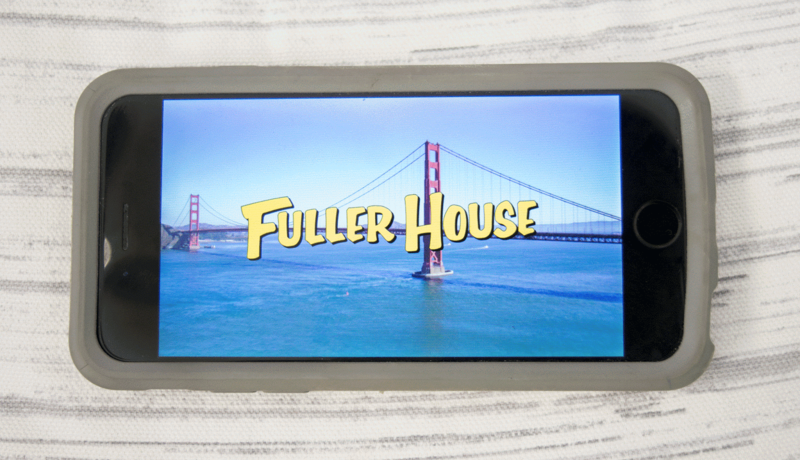 Have you started watching Fuller House?? If so let me know what you think in the comments! !Do you like it, love it, hate it!? Ive only seen two episodes so far, but it was sweet. Not my favorite show but it does bring me back to my childhood.